Even Fred Couples did not start out with the smooth, "perfect" technical swing. When working to improve a golf swing, many golfers seek to bring themselves closer to what is considered a "perfect" technical swing. While the exact perfect swing for each golfer will lead to minor differences in the ideal form from player to player, by aspiring to hit the key points throughout the swing process with the correct form in all parts of her body, a golfer can bring herself closer and closer to their perfect swing, to maximize her results on the course. Stand over the ball in a relaxed state, with your legs flexed and the joints through your core loose. A stiff swing will not come through with ideal form, leading to errant shots and a loss of power. Begin taking the club back by moving your hands, arms and shoulders back as a single unit, maintaining their shape and not bending any of their joints. Allow your back arm and wrists to bend naturally as you turn your shoulders away from the target. Finish the back swing with your shoulders having turned 90 degrees from their starting point, so that the back of your shoulders are now pointed at the target, with your hips turned approximately 45 degrees from their starting position when they were pointed down the target line. 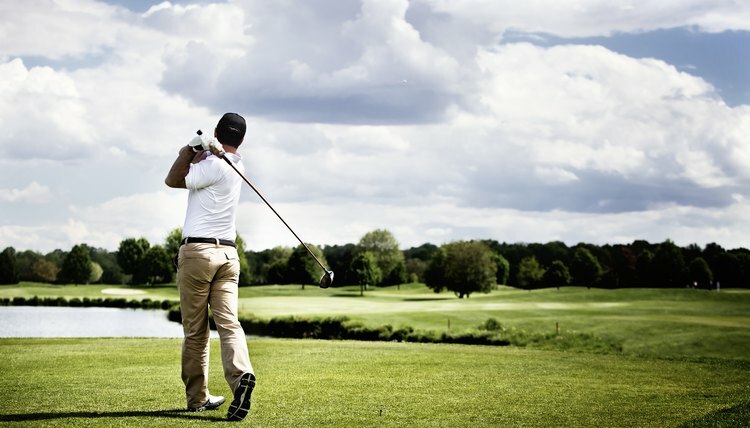 Swing down at the ball by turning your hips and shoulders towards the target, without uncocking your wrists. As the club is halfway through the down swing, the shoulders and hips will again be square to the ball and pointed down the target line. Continue down through the ball, shifting your weight onto your front foot, and bringing your wrists forward through the point of impact to put maximum speed on the ball. Follow through by continuing to transfer weight onto your lead foot, with your shoulders and hips continuing to turn until they are pointed at the target.